It's almost time for our AGM (Annual General Meeting)! 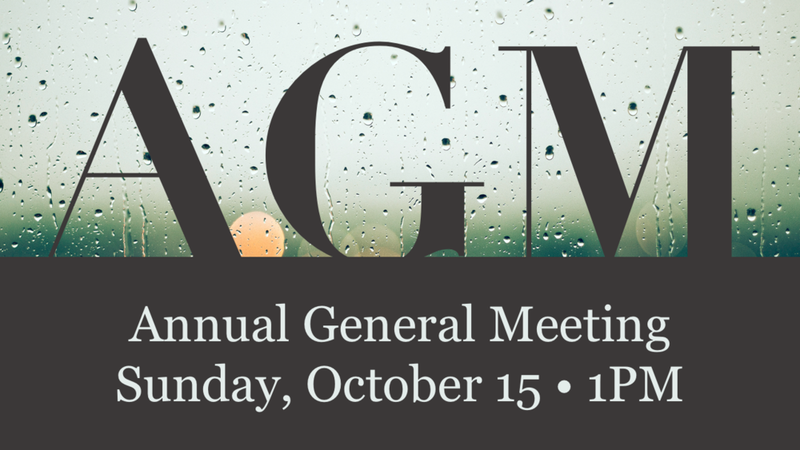 The AGM will be held on Sunday, October 15th after the 11am service at 1pm. Lunch will be provided at 1pm. Members of the church get to vote on important decisions that get presented at the AGM. If you're not yet a member, now is a good time to apply! We really value and the input from each of you here at Redemption. You can find more details about membership here and download the application here. If you're not a member, we still recommend attending if you would like to keep up to date with what is happening in the coming year at Redemption! If you have any questions, feel free to contact the church office at 604-732-5577 or email us. It's almost time for our AGM (Annual General Meeting)! The AGM will be held on Sunday, October 30th after the 11:15am service at 1pm. Lunch will be provided at 1pm. The membership application deadline to be able to vote at this year's AGM has passed, but all who attend Redemption Church are more than welcome to attend. In fact, we recommend attending if you would like to keep up to date with what is happening in the coming year at Redemption! Our next Annual General Meeting is scheduled for Sunday, October 25 from 1:30-4:30pm. Please plan to stay after the second service. Lunch will be provided. Childcare is available, please RSVP to Lisl Baker with the age(s) of your child(ren). Everyone who regularly attends Redemption Church is welcome to attend the AGM, but only members can vote - so now is a great time to apply to become a member! In order for your membership application to be viewed by the board before the AGM, completed applications must be received by the office before noon on Friday, October 9. If you have any questions, feel free to contact the church office at 604-732-5577 or info@redemptionchurch.ca. A special resolution to approve the sale of the Bernice Gerard Ministry House (BGMH) to the Pacific Centre for Discipleship Association (the owner/operator of the Menno Simons Centre). A special resolution to approve the purchase of the Hollywood Theater, to close shortly after the BGMH sale (we need the BGMH sale proceeds to afford the Hollywood!). A special resolution further increasing our borrowing limits to cover costs related to these transactions. A full members' package was distributed on Wednesday to all voting members. If you did not receive it, please contact the church office. Members: if you cannot attend the meeting, please give a proxy to another member you trust who can exercise your vote so that we meet quorum. Proxy forms are included in the members' package and available the morning of the meeting itself. For more information, please contact Tim (tim@pgcc.org) or Geoffrey (geoffrey@thetrotters.ca). Our Annual General Meeting will take place this Sunday, October 19 immediately after the second service at Redemption Church. Childcare will be available and lunch will be provided with a suggested donation of $5. All are welcome to attend and participate but only members can vote. Members: you should have received a draft agenda on September 25. If you did not, please contact Megan (megan@pgcc.org or 604-732-5577). If you're unable to attend the meeting, please fill out a proxy form and give it to someone you trust who will vote on your behalf. 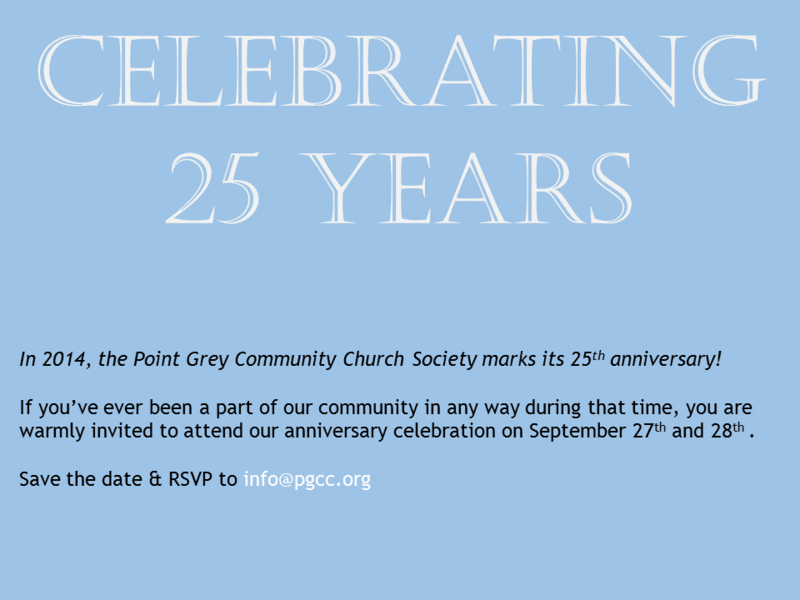 Point Grey Community Church will be celebrating 25 amazing years, and we would love for you to be a part of the festivities in September. This Saturday, September 27 there will be an informal reception and get together from 7-9PM at PGCC. Additionally, on Sunday morning September 28 we will remember and reminisce God's faithfulness to our community. This event is for you, your family, and anyone who has been a part of our community. Spread the word! Please send RSVPs or questions to info@pgcc.org. The Elders are calling an important meeting of the Members on July 6th, immediately following the service, to discuss issues related to our possible purchase of the Hollywood. Please mark this date in your calendars. All are welcome to come and participate in the discussion, whether you are a member or not, but only members can vote on motions. More details and documents to follow soon. Please note: the church office (and the info@pgcc.org account) will be closed from Wednesday, June 25th until July 2nd as a staffing transition takes place, so please address all inquiries to Tim or Geoffrey during that time. Greek Day aka Church on the Street Day! We've been hearing about how to live out our faith in community this last little while, and now we've got the chance to get practical! Last year we had a fabulous time doing the same thing at two of Vancouver's busiest street festivals, and made lots of new friends, helped people relax, and blessed many with rest and a place to pause amidst the crowds. This year on Sunday, June 22nd, our signature summer event will be on the street in front of the Hollywood Theatre for Greek Day, alongside community partners Kitsilano Neighbourhood House and Vancity. We'll need between 30-50 volunteers to make this event a success, so mark the date on your calendars now and join us that Sunday for some service in action! 4 volunteers for Greek Days Kids’ Area throughout the day to give Greek Days volunteers breaks. 4-6 people (in shifts of 2) willing to man our info table throughout the day and talk to people about our church as well as our history at the Hollywood/developments. If you're artistic or media savvy and want to help with presentation in advance - any graphic design, posters, business cards or ways to show who we are in a public space/format (art, posters, telling the story etc) would be helpful! 4-5 people to unload the van, set up tents, couches, tables and gear; help lift and carry things. Skills: muscles and ability to start at 9:00am Sunday. 4-5 people to pack up gear, clean up area; return things to church building and storage. Mingle, greet, facilitate area, provide info and water refills (cooler or bottles). Connect with people and chill out with them, monitor and keep area clean. Manage sidewalk chalk area for kids, chairs for parents to sit and rest in; manage colouring sheets of the Hollywood & handing out crayon boxes. Space for volunteers from Kits House and Vancity to take a break, get a snack, stash their gear, take a rest, connect with someone. 2-3 people wanting to gain event management experience to help oversee all areas and coordinate organization and trouble-shooting with Sarah Kift (basically be extra Sarahs - be able to know the big picture in terms of volunteers, logistics, timing, gear, and task lists as well as regular check-ins of specific areas). Volunteers to work alongside Kits House and Vancity volunteers at their tents throughout the day, running games and activities. Skills: people wanting to make community connections and build bridges with our partners; show our love for the community in a practical way through serving with them shoulder to shoulder. Scheduled shifts will be organized with Vancity & Kits House. All volunteers will be invited to an orientation/pizza party here at the church on Wednesday, June 18th, where you'll receive an awesome t-shirt to wear at Greek Days, your assigned role and shift time and a chance to meet and greet our friends and fellow volunteers and staff at Vancity and Kits House. Have you volunteered your time and talent in our church over the past year? Are you currently a member of a crew, team or group that serves the church? From ministry to moving gear to making lunches to making art, it's been an amazing season of life together, and we'd love to thank you in person, and share a meal with you! Join the staff and leadership team on Sunday, May 4th for a delicious bbq lunch following the Sunday service. We really look forward to seeing you there and celebrating with you, as this community is made up of so many amazing volunteers and our church team is deeply grateful for all of your service and love and time given so graciously and freely. And, if you're not yet a volunteer, but would like to be, please get in touch with us to join one of our many crews or areas of ministry. Your talent and time are always needed and appreciated. We could also use a hand for the BBQ if you'd like to help out - we want our volunteers to be relaxed and not have to work that day, so if you've been thinking about volunteering, make the BBQ your first foray into community life and service together! Call Sarah (604-732-557) to sign up to help. Make a meal for our latest crop of babies and their families! A baby changes everything, especially when you have little ones already and we want to help two of our famliies, the Barrys and the Hettlers adjust to these new changes and enable them to spend precious time together, so "Church from the Hollywood" has put together these meal planners so you can bless them with a meal during this transition. The day is quickly approaching for us to welcome into the world baby Hettler #3! I am sure you all share my excitement and joy for the whole family too, especially the girls as they will now be a BIG, BIG sister and BIG sister (that is how it was first described in our house). You will be feeding 2 adults and 2 children. If you could kindly drop the meals to their home around 5pm, and please understand their need for quiet rest and sleep. Thank you so much for your love and support for this amazing family. We wait with anticipation for the safe and joyful arrival!!! If you would like to sign up, you can access the meal schedule by clicking here, or by visiting TakeThemAMeal.com and locating the schedule by recipient last name (Hettler) and password (Baby). Garrett & Emily will be welcoming a second baby sometime very soon, and we are all looking forward to meeting the newest member of the Barry family! If you would like to sign up, you can access the meal schedule by clicking here, or by visiting TakeThemAMeal.com and locating the schedule by recipient last name (Barry) and password (baby).